If you follow me on Instagram (@vicckyt), you might know that I’m a coffee lover. The side effects of loving coffee and teas is that it stains and turns your teeth yellow; that is exactly the problem I have. I tried over the counter whitening strips 2-3 years ago and it worked for a while. I don’t know if it’s because I constantly drink coffee but my teeth was becoming pretty yellow again. The yellowing of my teeth was always something I’m self conscious about, especially when I take photos. I thought about using whitening strips again but my teeth was always very sensitive to the whitening strips; after a few uses I usually felt an odd tingling. 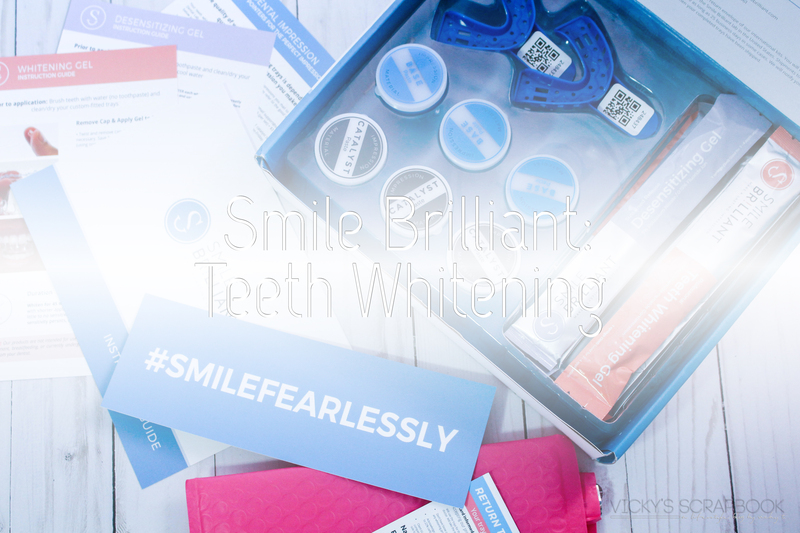 So, I tried Smile Brilliant, which is a teeth whitening service that delivers custom whitening trays from the dental lab to my door. 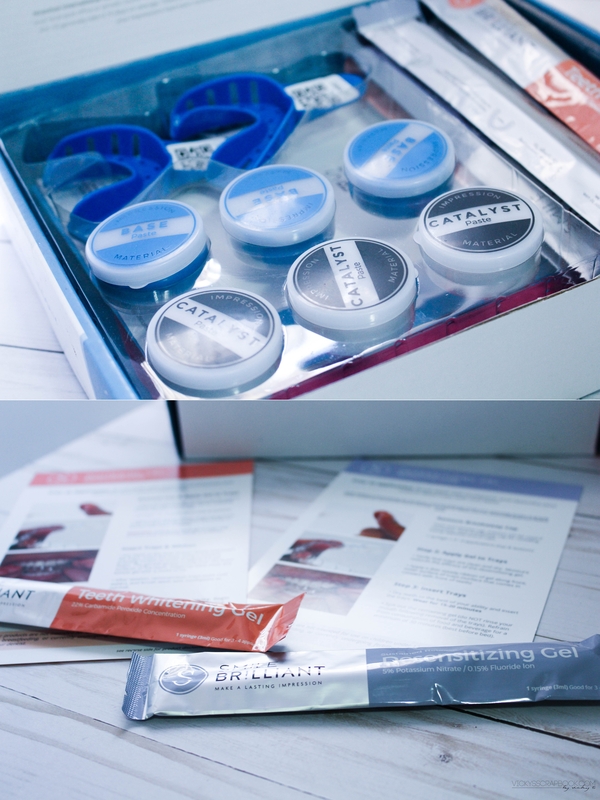 When I first receive the package in the mail, it comes with 2 impression trays, 3 sets of impression material, 3 way postage, teeth whitening gel, desensitizing gel, and detailed instructions. The first step in the whitening process is to make your impressions. 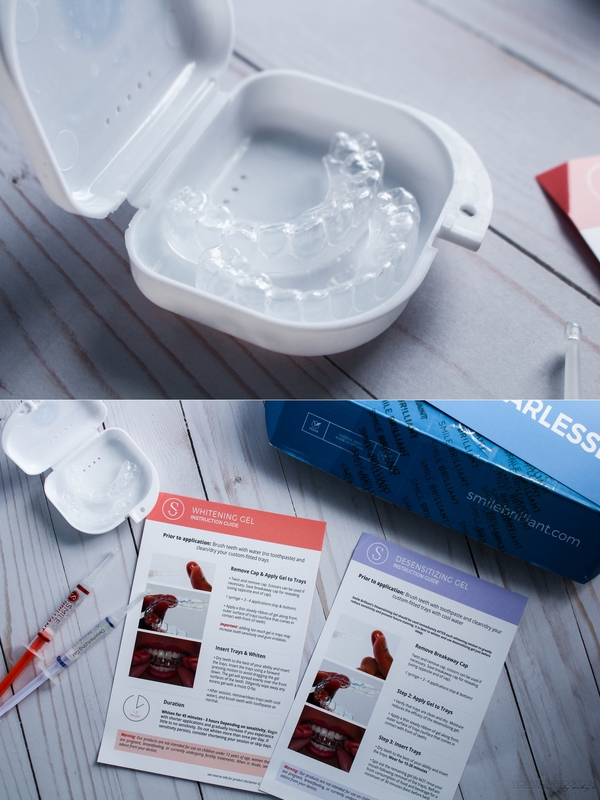 There are 2 impression trays and several materials in the box with clear details on how to mix the two materials. This is for the convenience of not having to visit the dentist to get an impression of your teeth. Personally, the making of the impressions was probably the worst tasting part of the at home whitening experience. It’s a super convenient way of doing whitening. I like to pop on the whitening trays before I enter the shower and leave it on until a little before I go to bed. I didn’t have to use all of the whitening and desensitizing gel I received but I still got great results. In comparison to whitening strips, I felt that the desensitizing gels really helped and I didn’t feel any discomfort during the process. The only thing I would complain about is the taste when I accidentally put too much gel or if it leaks out of the trays; it doesn’t taste great but I don’t think there’s any dental related things that do. Taste aside, the results are amazing. 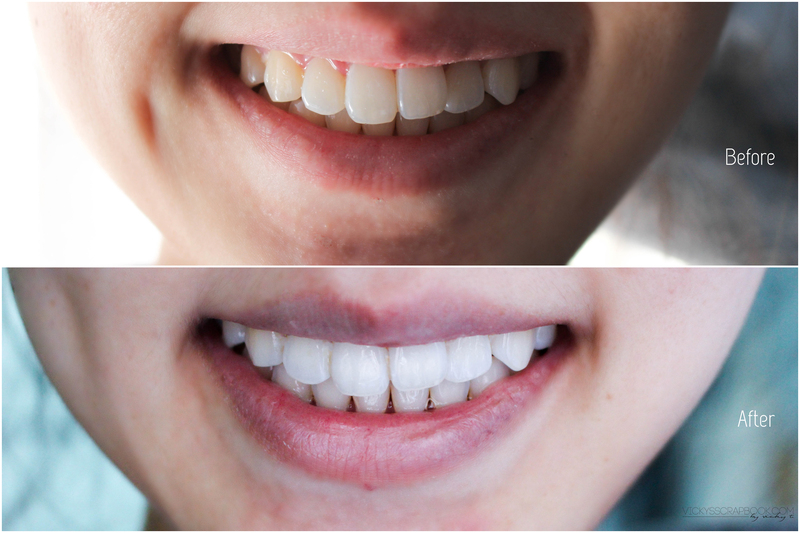 As you can see, my teeth is truly whitened after using Smile Brilliant. 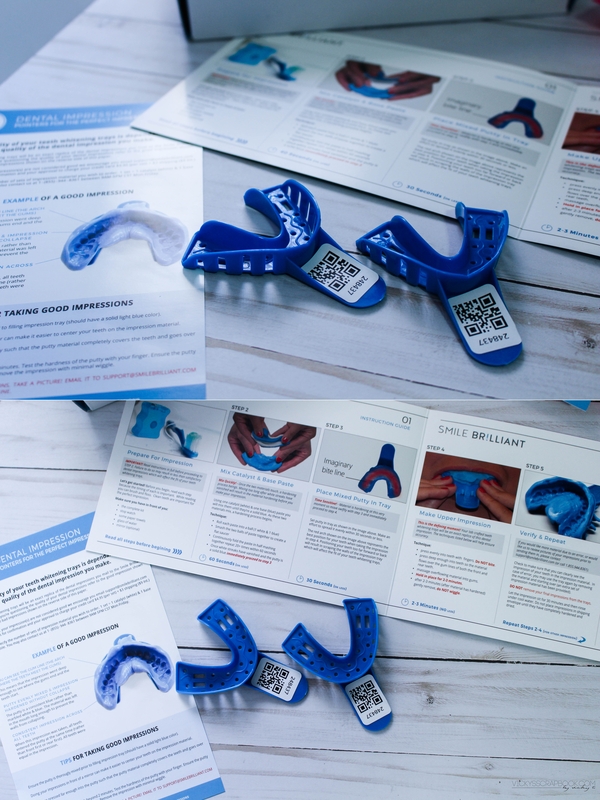 If you are interested in Smile Brilliant, check them out on their website. Now I can truly smile fearlessly and you can too! 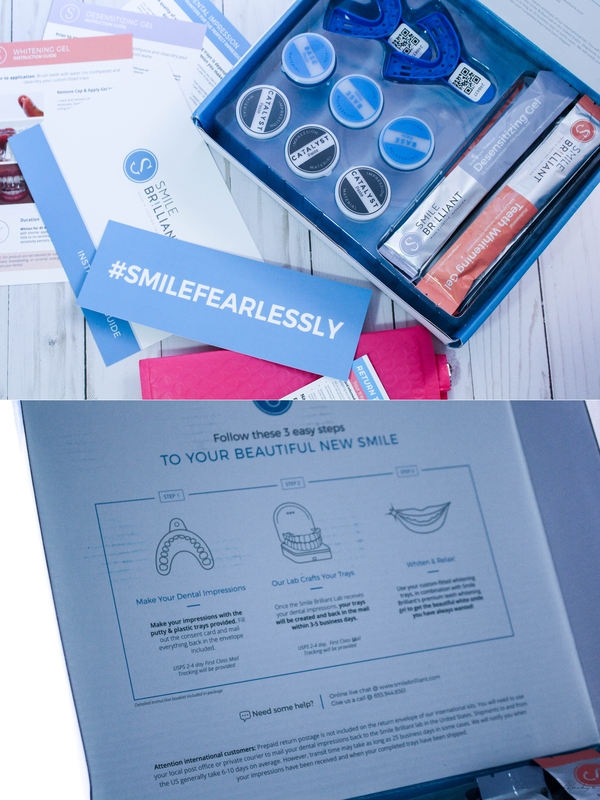 I’m collaborating with Smile Brilliant for this review and one giveaway for my readers. The giveaway is only open for 2 weeks (eligible for people in these countries: US, UK, Australia, & Canada). Just follow this link directly to enter the giveaway! Even if you don’t win the giveaway, you could use this code: vickysscrapbook15 to get 15% off sitewide. Your results are great!! I’m currently trying to whiten my teeth with a set from my dentist but the Hydrogen peroxide gel makes my teeth sooo sensitive, it’s awful!